The Lake of the Woods County Museum has a large display area, audio-visual programs and a comprehensive library, which includes microfilm of the county newspapers from 1907-1960. The museum is staffed with a full-time curator/historian. Exhibits focus on the geological formation of Lake of the Woods, the natural history of the area, native cultures, the great forest fire of 1910, commercial fishing, logging and the pharmaceutical industry. Museum hours are Tuesday-Saturday 10:00 a.m. to 4:00 p.m. May 1- October 1. Special programs are often provided during the off-season, call 218.634.1200 for more information. *Click on link for more information. The Baudette Depot, built by the Canadian National Railways in 1923, replaced two earlier depots (1901 & 1908) both lost to fires. The Baudette Depot was a living, breathing entity. It was a place of constant movement, a place of joyous reunions and sad goodbyes, a place alive with stories. The stories didn’t begin or end at the Depot, but a chapter took place there. The 1923 Baudette Depot was abandoned by the Canadian National Railways in the mid-1980’s. The Depot sat empty and abandoned for over twenty years. It once served as an integral part of the entire transportation system of the areas, when all of the traffic into or out of the country came by river or rail! Freight, groceries, mail, human and animal cargo came into the region “en masse” by rail. Products shipped out included timber, fish, furs, grain, and blueberries. Hundreds of people used the railroad and depot every year in the early days of the 20th century. In 1997, the Depot Preservation Alliance (DPA) organized to preserve the Baudette Depot and adapt it for reuse. The DPA purchased the Depot from the Canadian National Railways in 1997 for $1.00. The Depot sits on land leased from CN (Canadian National Railways), and listing on the National Register of Historic Places was accomplished in August 2005. From 1997 to 2007, a major capital renovation funding campaign was launched. Building renovation began in the Fall of 2010, with its completion in the Fall of 2011. Fort St. Charles is the site of the exact location of the original fortress and fur-trading post erected in 1732, by the French-Canadian voyageurs led by Pierre La Verendrye. Located at the NW Angle, this fort is surrounded by primitive rugged beauty as intriguing today as the day the early voyagers who braved it over 250 years ago. Indians later came to the fort bartering their furs, and some started to settle in the same area and grew sow corn and peas. A reconstructed fort is available for touring and is open to the public. The fort is on Magnusons Island, located at the Northwest Angle. Accessible by boat, the Island Passenger Service of Angle Inlet, MN can provide you with transportation to the fort; during the winter months a snowmobile trail is open. The history of Norris Camp began in 1933 with President Roosevelt’s New Deal programs. The Civilian Conservation Corps (CCC) was one of these programs and it became the impetus for creating Norris Camp. The CCC was created to help spur the United States’ economy out of the Great Depression by hiring unemployed young men for public conservation work. Close to 200 men and officers were stationed at Norris Camp performing a variety of tasks. Faunce is a 100 foot stairway tower erected by the Civilian Conservation Corps in 1935. 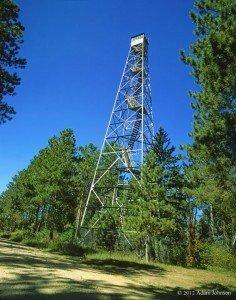 It replaced an older tower (Faunce Fire Tower) located 3 miles to the south of the original along Faunce Forest Road. One of four towers in Beltrami Island State Forest, it also marks the lost village of Faunce. Faunce campground is located at this site, which stands roughly 12 miles south of Williams on Co Rd 2. Jesuit Father Jean Pierre Aulneau and 20 men headed to the NW Angle in the summer of 1736. While visiting an island of Sioux Indians in hope of making peace with the inhibitors, the explorers were murdered. Now a cross marks the spot of the massacre on the highest hill in respect for those lost. Accessible by boat or snowmobile, the island has been a historical destination for many throughout the years. To order additional information Click Here or call 1-800-382-FISH.